We recently showed you a teaser ad that Motorola had put together for its Honeycomb flavored XOOM tablet. The teaser took a shot at Apple, the iPad and the Cupertino based firm's famous 1984 "Big Brother" ad-still considered today by many to be the best Super Bowl commercial of all time. 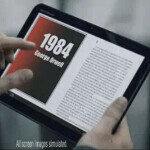 15 seconds of the actual Super Bowl ad for the Motorola XOOM has leaked and there really isn't too much to say about the clip except that the theme appears to be that Motorola's device is different than the tablets already being sold (Note that the book that the XOOM user is reading on his tablet is 1984). A great Super Bowl ad can help a new product launch with a gigantic buzz, but in the case of the Motorola XOOM, the device has already captured everyone's attention since the CES.